Just a few years ago it was unthinkable to be able to observe some common wood pigeons while comfortably seated on a bench of a public garden in a city of South Europe and see them walking around to peck crumbs and left overs of our quick meals, together with the sparrows and the ubiquitous city pigeons. The few common wood pigeons visible at that time were only a consequence of the autumnal migrations that led these birds, by the first October rigours, to abandon the Euro-Asian continental areas to reach more suitable locations where to spend the winter. It was then unthinkable to meet it right in town surrounded by the city hustle and bustle. It was a wild bird, wary, careful, circumspect and difficult to approach, characteristics that are still now present in the country specimens or in the populations living far away from the anthropized sites. It was however enough to go in any London park to see it walking between your feet in great number, cooing loudly over the lowest branch two palms from the head of a gentleman sitting on the bench when not even while brooding at the entrance to the park indifferent to human presence. An urban bird, nowadays accustomed to city life. Conversely, the real character of this bird is well known to the hunters who hunt it actively seen the great number and the goodness of its flesh. A wary prey, very intelligent in dodging the tricks and the decoys placed for attracting them. Even, due to its invasive character, in some nations like the United Kingdom, the hunting season for this bird lasts practically the whole year rightly because it is considered as dangerous to the agriculture. 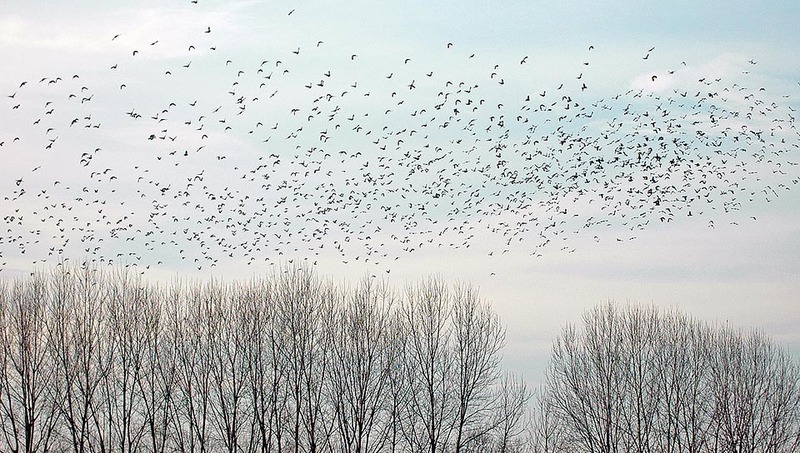 Conversely, in South Europe where converge the enormous migrating populations coming from the north continental areas, the hunting activity is done only in autumn with great expectation and passion by a considerable number of hunters. 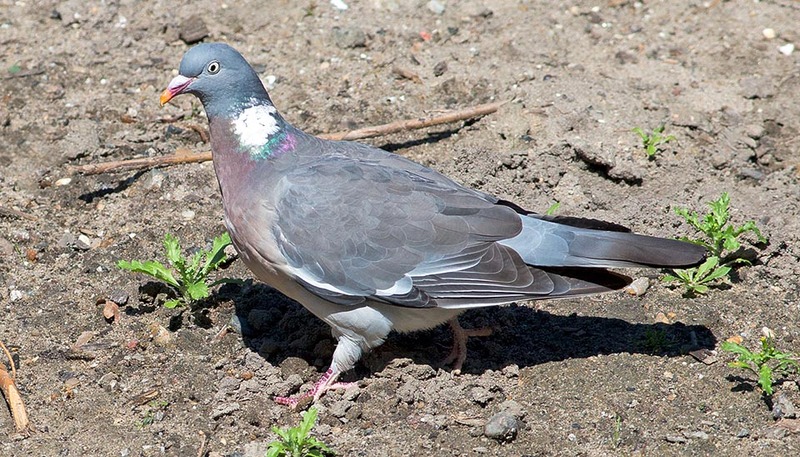 The Common wood pigeon (Columba palumbus Linnaeus, 1758) belongs to the order of the Columbiformes and to the family of the Columbidae and is the biggest and the most diffused among all European pigeons. 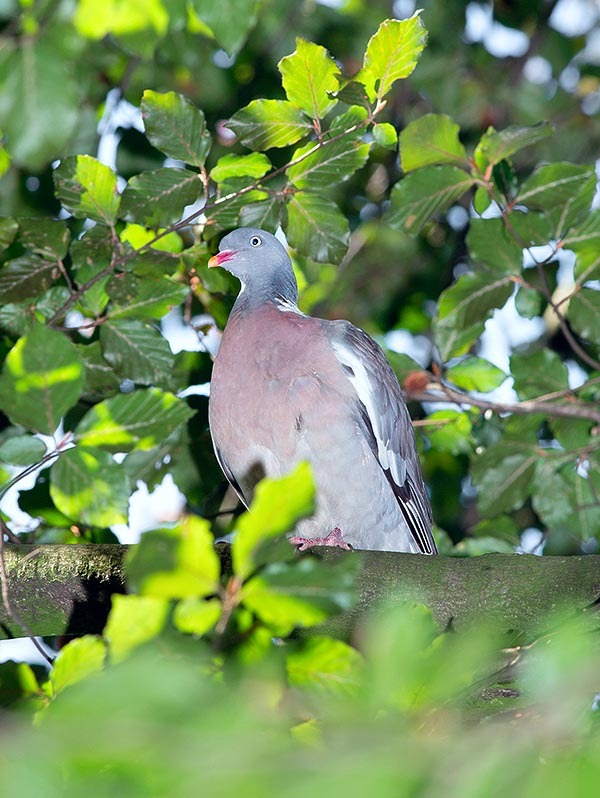 As previously mentioned, along with the Rock pigeon (Columba livia) and the Eurasian collared dove (Streptopelia decaocto) has become during the last decades an invasive species and is now in excess. As a matter of fact, a few five years have been sufficient for seeing this bird invading the cities of South Europe, still free, conquering quickly any green space and now even the rural and abandoned buildings. Their number has so constantly incremented to reach dangerous levels also in areas where till a few decades ago it was practically absent. As often occurs, the genesis of the scientific names gets lost disorderly over time, originating various and confused interpretations. The etymology of the scientific name originates from the Latin “columba”= pigeon or dove, term in turn coming from the old Greek “kolumbos” = diver, he who dives head down, due to the odd behaviour while flying of this bird. Furthermore, kolumbus has given the name also to the genus Colymbus (synonym of Gavia and Podiceps spp.) to which belong species of typically diving aquatic birds. This strange derivation has however created some discrepancies between the vulgar names used in North America, where for colymbus they intend the Grebes (Podiceps sp.) and those used in the ornithological world who, conversely, consider them as the Loons (Gavia sp.). Just to render the interpretation even more chaotic, we have finally to remind that with the Icelandic term klumba they indicate the Guillemots (Cepphus grille) rightly due to the similar size and to the fact that also them lay two eggs as typical to the Columbidae. By sure the historical prevalence on this northern language, stands in favour of the Latin but it would be interesting to know its origins and the matchings or perhaps the linguistic copying and misspellings occurred during the centuries. 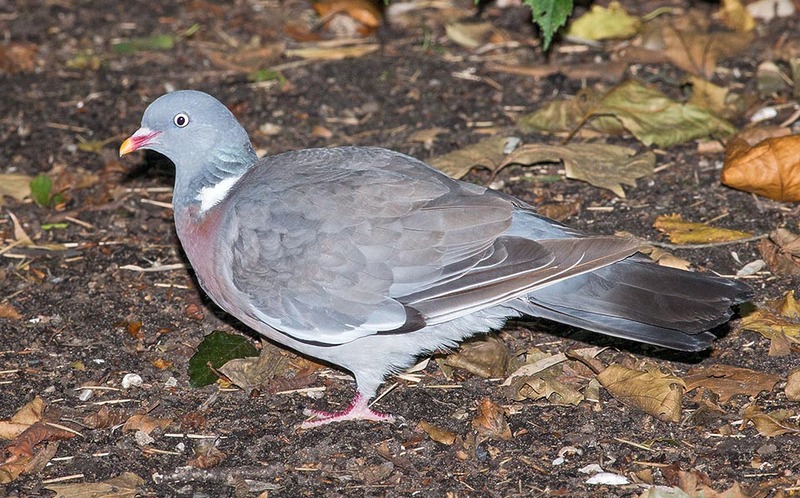 The name of the species palumbus also comes from the Latin, but simply from “palumbes” = wild pigeon, because of the prevailing habitat of this bird. This bird is called Wood Pigeon in English, Pigeon ramier in French, Ringeltaube in German, Colombaccio or Palombo in Italian, Paloma torcaz in Spanish and Pombo-torcaz in Portuguese. 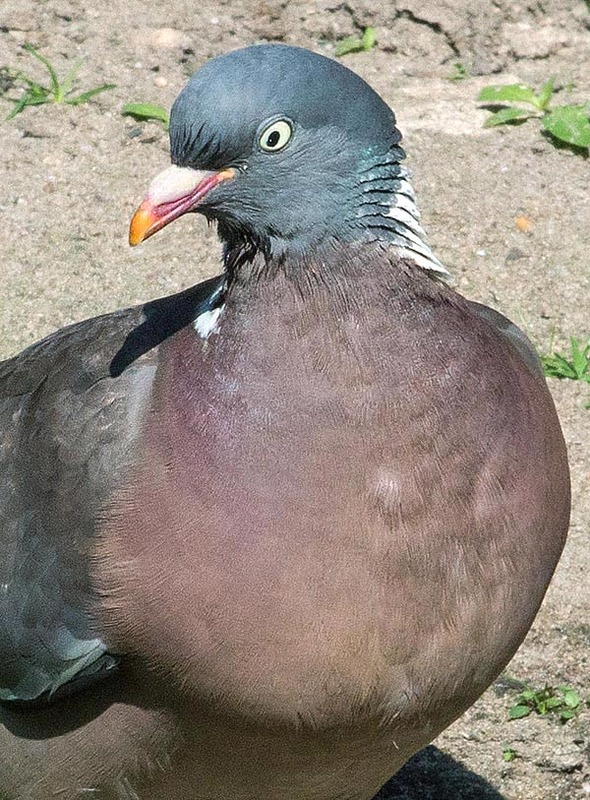 To notice the weirdness in the Iberian languages where the name torcaz comes from the Latin torques = band, collar, rightly due to the drawing it has on the neck but the same term then misspelled in trocaz, has given the name to a species of wood pigeon endemic to the island of Madeira (Columba trocaz). 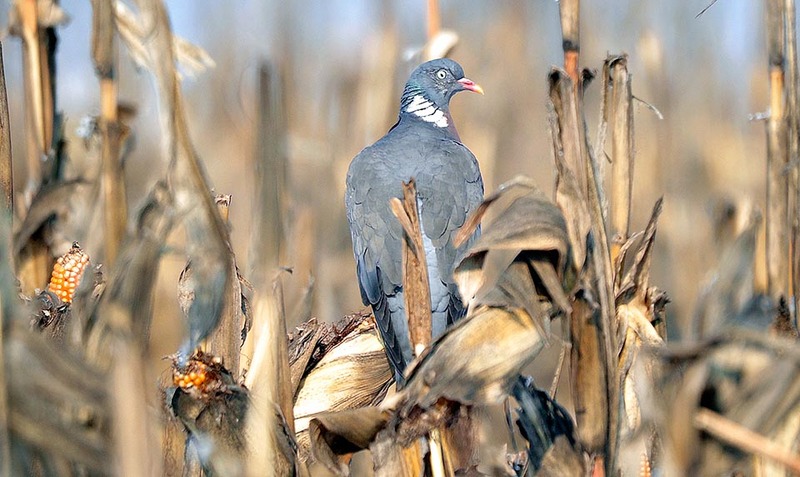 The wood pigeon occupies a very vast territory covering Europe totally up to the Urals and, through the Middle East, the temperate belt of the Asian continent up to the Indian plains. It is absent in Iceland, in the extreme north of the Scandinavian peninsula and of Russia and in the territories north of the great Asian mountain chains. In India it is absent in the tropical part of the peninsula. Is also present in Africa, but only in Morocco, Algeria and Tunisia. Six subspecies have been classified, some much localized and linked to very remote insular environments. The Columba palumbus azorica, of the Açores Islands, the Columba palumbus maderensis, a subspecies perhaps already extinct of Madeira Island, the Columba palumbus casiotis, typical to Asia, the Columba palumbus excelsa of North Africa, the Columba palumbus iranica, the subspecies of Persia and the Columba palumbus palumbus, the most diffused and typical to the European continent. The wood pigeon is widely resident in the areas where the winter snow cover is absent or is poorly present. Having a very varied alimentation, it might even survive to fairly rigid winters adapting to even unusual foods. However, the continental populations undertake during the autumn important movements that lead them into the Mediterranean area where the weather conditions are more favourable and the food can be easily found. The drastic changes occurred in the agricultural activity during the last decades, with the massive introduction of crops in monoculture of corn, soybean and sunflower, has enormously favoured the increase of the European populations of this bird, making it reach even unbearable limits to the agriculture itself. This overcrowding has surely caused that massive occupation of the territories previously loathed for fear and precaution, obliging it to abandon the typical habitats it was accustomed. 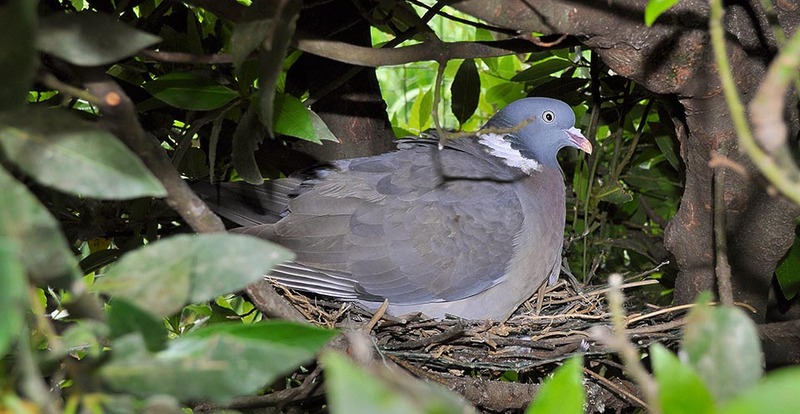 The traditional habitat of the wood pigeon is, as states the English vulgar name, the wood or the forest of broad-leaved trees but now we find it averywhere, having become accustomed to any situation. Gardens, parks, thickets, poplar woods, ripes of river, the long lines of trees in the cultivated country, a tuft of green or a mass of brambles, this has become the habitat of this bird. It does not love mountainous environments, apart in the Moroccan Atlas area. The maquis, where it shelters for many hours, is then the starting point of its excursions in the surrounding countries, where in flocks at times exceptional, it surges causing often serious damages. The wood pigeon is really a great and robust pigeon, even almost the double than the very common rock pigeon. Despite having the same features, the same behaviour and at times a very similar livery, they lead two distinctly separate lives and only rarely they may be observed together. Only this time it may be noted the considerable difference in the size and observe those small details that are determinant in the classification of the species. A more tense and nervous flight that of the pigeon and more listless that of the wood pigeon, a defiant attitude of the last one who keeps when flying the head raised and lofty whilst the rock pigeon is more compact and rounded in the shape. 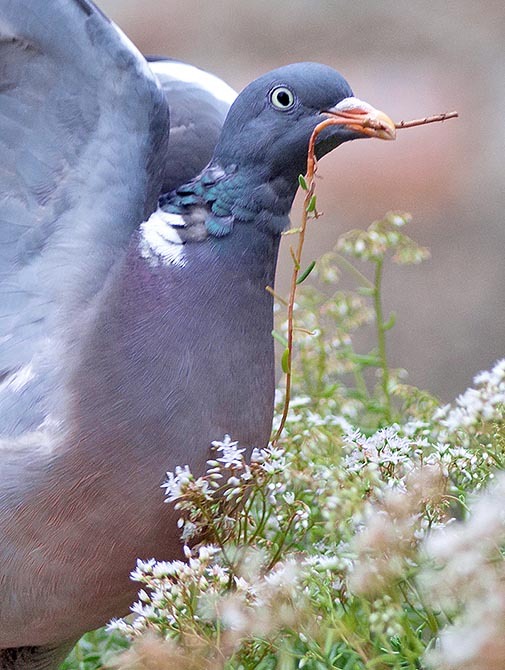 The wood pigeon likes to lurk on the leafy trees whilst the rock pigeon prefers the cables, electric poles, roofs and constructions. If in the rock pigeon the livery can be very variable due to the continuous crossings with domestic species, in the wood pigeon it is always constant and evidences the alar belt and the white collar. Furthermore, the flight is very noisy, especially on departure. The wood pigeon can be more than 40 cm long, with a wingspan of 75 cm and a weight that may reach the 600 g. The shape is slender with the tail barred by some very dark belts; neck and head very prominent on the body. The livery is bluish grey on the head and the upper part of the body with a bluish bronze attenuation on the chest. The neck has a typical white collar limited to the nape, very marked with the age, accompanied by two transversal bands on the wings, visible when flying. The eye is pearlescent white as well as the cere that dominates and contrasts in its turn with the wine yellow bill. The pupil is very often elliptic and not perfectly round. The legs are very short and robust as traditional in the columbids. There is not an evident sexual dimorphism and also the young have since always the livery of the adult even if missing of the lively colours and of the whitish marks of these last, plumage they get only when 6-8 months old. 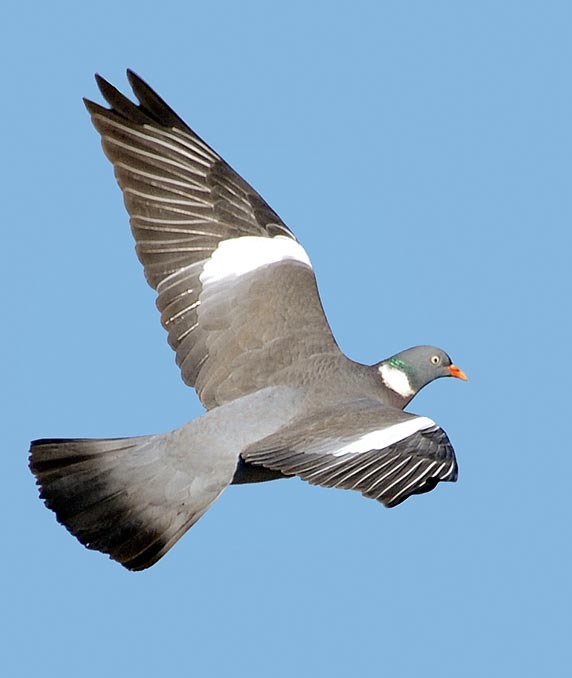 Another very similar congener is the well known Stock dove (Columba oenas), slightly smaller in size, that shares good part of the territory and often winters together in mixed flocks. Almost similar livery if not for the absence of the whitish marks present in the wood pigeon. Like all pigeons, also the wood pigeon coos, with a very low and gloomy tone, somewhat longer than that of the other congeners in the beats but persistent and audible from far away. It emits groups of five syllables with the accent on the first one: “kùùùù-kuu kuu-kuu kuu” unlike the stock dove that emits two of them, accenting the second, and the Collared dove (Streptopelia decaocto) who emits three of them, but accenting the second. As often is noted among the columbids also in the wood pigeon the couple is vey close-knit and the partners do not accept elopements. They are also very territorial and defend their own space vigourously even though, later, at the moment of reaching the feeding sites, they gather in thick flocks and coexist peacefully until the time of coming back to the nest. The courting is typical to the pigeons, with very frequent approaches and preening and with the typical territorial flight of the male characterized by frequent wheelies and wavy dips, characteristic that is rightly taken in the etymon of the scientific name. The nest is a feeble platfprm formed by dry twigs of reduced size, leaning on a horizontal branch or a support of climbing ivy, in thick bushes often inaccessible or of difficult access also for themselves. These twigs are not collected on the ground but are always removed, even with remarkable difficulty, directly from the trees, using the bill. Often, while flying off suddenly from the nest the specimen hits violently the shrubs and the brambles losing down and giving the impression of being seriously injured. 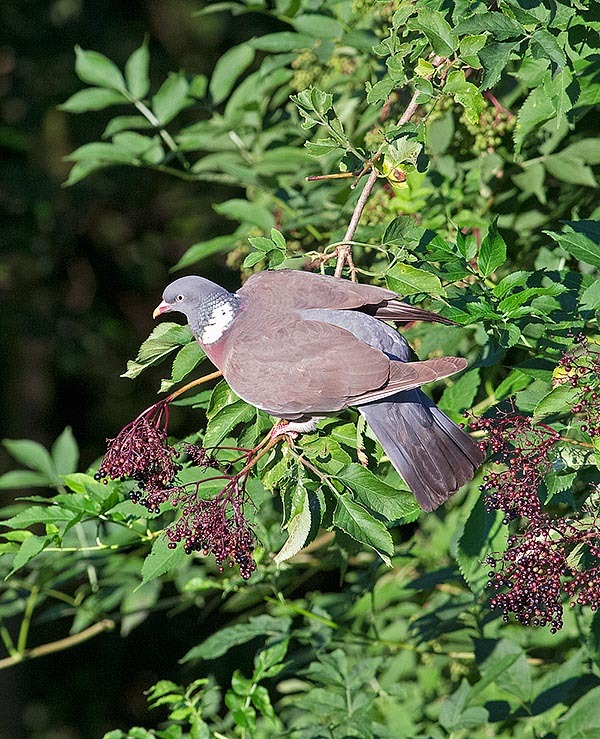 But the wood pigeon is an extremely robust and strong bird, able to break through any obstacle during the flight. 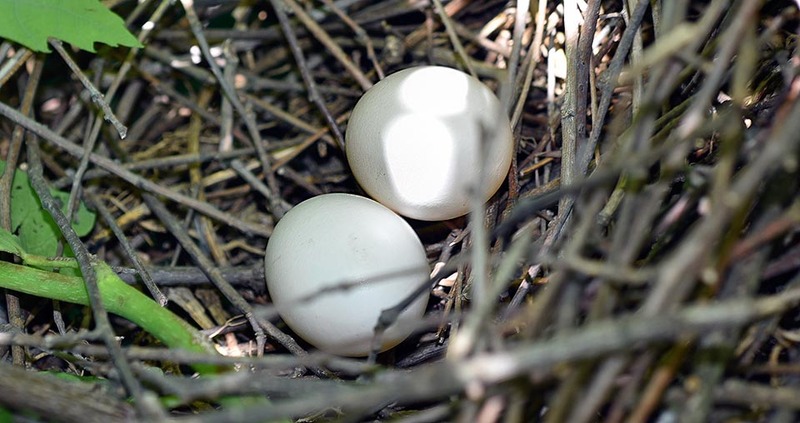 Conversely, the nest is very weak and so much inconsistent that often it is possible to glimpse from below the very white eggs that stand inside. It lays two eggs but usually nidifies twice a year and not rarely even thrice. The brooding lasts about 18 days and is done by both parents and the chicks are nourished with the so-called pigeon milk, the typical pre-digested and very nourishing secretion regurgitated by parents directly into the goiter of the nestlings. The growth is fast and at about 4 weeks form the birth the young do reach the adults’ size and after one week more they are ready for the flight. 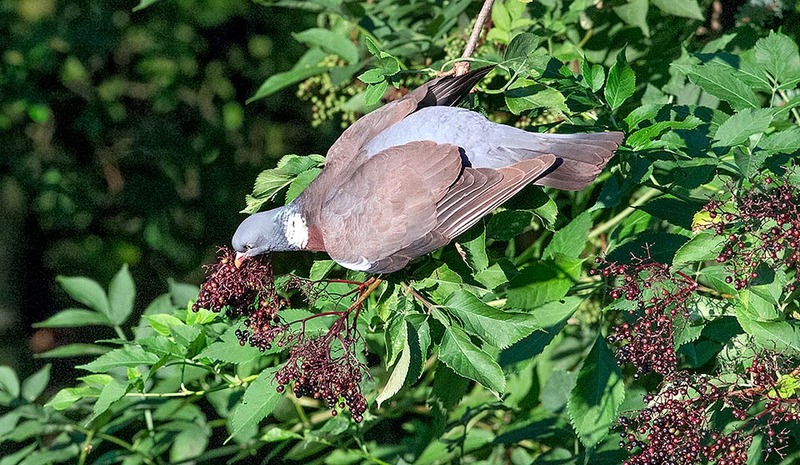 The wood pigeon is, as they say, a good fork and may ingurgitate a quantity of unthinkable grains in very short time, after which then goes back to its usual leafy trees where stays whole hours dozing and digesting the lavish banquet. They are greedy of corn, sunflower, soybeans, rice, grains in general but also of alfalfa and clover. It loves very much also the ripe fruits, elderberries, apples, acorns, beeches inflorescences, fruits of wild ivy and even of invertebrates. Unfortunately, it is a destroyer of crops when in at times immense flocks, gets on these areas like grasshoppers and in a very short time it eats and destroys, staying with its weight on the ripe stems, causing their breaking. Also the just sown fields are object of frequent devastations and rightly for this reason it is considered by the farmers, during the reproductive period, a real scourge. For the hunters and also for the farmers joy, the wood pigoen is not surely a species in danger seen the increment noted all over Europe, even if under certain aspects and in some instances, it was matter only of mass movements of populations that have become anyway sparser in the marginal territories.